Do I Need Impact Rated Bits? I have come across this question dozens of times. I’ve read article after article and review after review touting that impact rated bits are a scam, not worth the money, no better than standard bits, and more. Customer reviews slam these accessories as an unnecessary expense developed by manufacturers as a way to make more money. We even published an article about impact rated bits and found that Bosch’s standard bits outperformed all of the impact rated ones we tested based on our methodology. Read our original article Are Impact-Rated Bits Worth the Money? So why even bother revisiting this idea? I’ll admit, I’m a pretty loyal guy. I don’t know everyone at every tool manufacturer, but I do know that the ones I’ve had a chance to get to know don’t produce garbage and keep it on store shelves. So I set out to discover what the real deal is with impact rated bits. Knowing the depth of the Research & Development and Engineering teams at Milwaukee Tool, I enlisted their help in uncovering the mystery. They graciously took the time to answer my questions and allowed me to get an idea of the technical side of these accessories. Milwaukee makes the Shockwave lineup of impact rated bits and accessories. In addition to getting feedback from their technical folks, I also got my hands on Shockwave bits, nut drivers, extended bit holders, and 30 Degree Knuckle to work with. How are Impact Rated Bits Different than Standard Bits? Standard bit against the Milwaukee Shockwave bit. Notice the thinner ShockZone in the center of the impact rated bit. The most basic idea when looking at impact rated bits versus standard bits is to look at the differences in design. It starts with material itself. Milwaukee blends a custom steel that provides more ductility than in their standard bits. If you think back to high school chemistry, ductility is the ability of a solid to deform under stress from tension. Most of us were introduced to this using the example of metal being stretched into a wire. For impact rated bits, this ductility gives them the ability to twist and flex under stress from the torque of the impact driver. In addition to the steel blend itself, Milwaukee also includes a “Shockzone” in their bits. This area is very obvious as the narrower zone in the middle of the bit. It allows for additional flexing to buffer the bit from torque while still giving the tip the chance to rotate and further drive the fastener. If Impact Rated Bits are Designed to Take the Torque, Why Do They Still Fail? There are a couple of reasons that impacted rated bits will still fail. The first is shared with standard bits. When the bit slips in the fastener head (affectionately called cam out), the fastener head becomes noticeably damaged. What isn’t as obvious is that the bit tip is also becoming damaged. Each time cam out occurs, the tip becomes more and more rounded until it can no longer effectively drive. Two ways to avoid this are to ensure that you are selecting the correct size bit to match the fastener and ensuring that you are putting enough force against the fastener to ensure the bit stays engaged. In these two pictures, take a look at the difference between low speed/low torque cam out and high speed/high torque cam out. With lower forces, the bit transfers the majority of the damage to the fastener head compared to the new one. In the high speed test, the bit took much more damage and the fastener took less. This is an issue for both impact rated and standard bits. The next discussion is about metal fatigue. Grab a paper clip and bend it. Now bend it back. The metal has enough ductility to reshape under the stress you’re putting on it. It takes a toll though. Continue the same back and forth motion. Eventually, the metal will weaken and break. Touch the area where it failed immediately and you’ll notice that it’s warm. This is what metal fatigue does. The movement is able to absorb the stress for a certain amount of time, but not indefinitely. As the impact rated bits flex, they are experiencing metal fatigue which is not something that can be undone with rest. Eventually it will break. Now grab a pencil, preferably one you don’t intend on using again. Gently bend it, but not too much. You’ll notice it will flex, but not nearly as much as that paper clip did. Go ahead and put some more force into it. The fact that it broke without bending as much as the paperclip shows that it is less ductile (if it were metal). It can’t reshape as easily and instead breaks immediately under pressure. While it’s not perfect, the paperclip and pencil demonstrate the difference between standard and impact rated bits. Standard bits can be made very strong, but the trade off is that they are more brittle. When they have the extreme torque of an impact driver placed on it, it snaps quickly. The impact rated bits blend strength and ductility to continue driving while it absorbs the torque. Eventually, it will succumb to metal fatigue, but it will last a lot longer under that stress. The engineers that designed the Milwaukee Shockwave bits are smart – really smart. A lot of testing went into developing a steel blend that will absorb that torque and withstand metal fatigue for an impressively long time. Finding a balance between flex for absorption and strength to drive is no simple task, but the result is that the Shockwave impact rated bits experience failure from metal fatigue much later than a standard bit would snap. In fact, under that kind of stress, Milwaukee Shockwave bits will survive up to 10 times longer than standard bits. Why Do Standard Bits Keep Outperforming Impact Rated Bits in Testing? This is the million dollar question – and it has everything to do with testing methods. 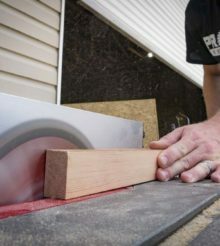 If we put up impact rated bits against standard bits using a 4 inch deck screw into pressure treated lumber, we’re in the standard bits’ happy place. The standard bit never reaches anything close to its failure point, even with an impact driver. Most reviews that I read have the impact rated bits reaching their failure point first. I read very few studies that found bit breakage as the failure. Virtually all of them listed bit rounding as the point where the bit was considered failed. Many suggested that the point of failure is when three cam outs were experienced in a row. If we think about it, the softer (more ductile) bit should round faster! With this testing method, all but the worst standard bits are going to outperform impact rated bits. The Milwaukee Shockwave impact rated bits are designed to outperform standard bits when the maximum torque of the driver is applied. We’re talking the kind of torque that snaps a standard bit on the first try. Most fastening jobs don’t come anywhere near that force. To get to the point where the impact driver is delivering torque to its potential, we’re talking about metal to metal fastening where high torque is required to break the friction between the metals. We’re talking about hard stop fastening where you reach the end and the driver delivers all of its torque it has to tighten it down. We’re talking about long lag bolts where the driver delivers not only high torque, but for an extended time and really pounds at the nut driver. These are the kind of applications that standard bits and nut drivers can’t hold up to and snap, usually at the tip or shaft where they are weakest. So Bottom Line, Do I Actually Need Impact Rated Bits? For most fastening applications, no, you don’t. Unless you’re doing the applications mentioned above or others that push your impact driver to really drive to its potential, you’ll actually get better performance from the standard bits. There is room in your tool box for these bits and accessories though. Sooner or later you’ll come across the need to break loose a stuck nut, drive a screw into metal, or drive a large lag bolt. When it comes to driving screws and you need to make a decision, the general rule of thumb is to use standard bits on wood and impact rated on metal. I can openly say that I think all professionals should have a set of impact rated bits and nut drivers like the Milwaukee Shockwaves in their tool box along with an extended reach bit holder or two. It would benefit most homeowners that keep an impact driver handy to have a set as well. Understand both the expectation of performance and the cost though. Don’t use them if the application doesn’t call for them. Just because you’re using an impact driver doesn’t mean that you need to use impact rated bits. Save those more expensive accessories for when the situation makes sense to bring them out. A HUGE thank you goes out to the Engineering Team, R&D Team, Project Managers, and Kharli Tyler at Milwaukee Tool for the work and research they put in to developing the Shockwave lineup of impact rated bits and accessories as well as putting up with my curiosity and desire to understand the technical details of that work! So are impact bits softer or harder? Making them harder would make them more brittle. In my experience, whenever I use impact bits I break them. Complete failure. I wonder if normal bits would be better to use. If impact rated bits are made harder by including more carbon or something then I see why they would be breaking so much. I learned about steel from sword making. A good 1050 steel is a nice middle ground. I have tried the shockwave 5/16 on an industrial job, and blew them apart like a 2 dollar watch. I drive about 6000 self taps in metal each day. I have done better with their torx bits, they outperformed 20 dollar apex bits. The best bits on the shelf of lowes/Home Depot are dewalt.